Some 35 to 40 countries could produce nuclear weapons "in just a few months," the top United Nations nuclear watchdog warned in an interview published Friday. International Atomic Energy Agency director Mohammed ElBaradei told the French newspaper Le Monde that the ease of producing nuclear weapons poses a stark challenge to the 1970 Nuclear Nonproliferation Treaty. 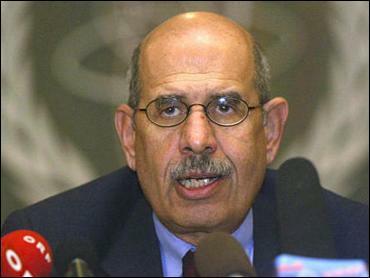 ElBaradei said an estimated 35 or 40 countries "could produce a weapon in just a few months" if they decided to break the treaty. Even under the requirements of the treaty "there is nothing illicit for a non-nuclear state to conduct uranium-enriching activities … or even to possess military-grade nuclear material." "We have to reach agreement on limiting the construction, in civilian programs, of nuclear material for military ends by confining this to installations under multilateral control," he said in excerpts of the interview printed by Agence France-Presse. In one of those potential nuclear powers — North Korea — ElBaradei said nonproliferation efforts were "on the verge of catastrophe." North Korea has agreed to more talks to resolve its year-long dispute with the United States over its nuclear weapons program. But the isolated communist state is believed to already possess one or two crude nuclear devices. On the other hand, ElBaradei said in an interview for Friday's edition of the German newspaper Frankfurter Allgemeine Zeitung that Iran appeared to be doing more to cooperate with the agency than it had in the past. "We have better information. The Iranians have handed over a document which they say is a full disclosure," ElBaradei said, as a deadline for Iran to prove that it isn't building nuclear weapons expired Friday. "I hope this is the case." A spokesman for the U.N. nuclear agency said the documents handed over by Tehran appear "comprehensive" but that experts must finish comparing it with evidence they are collecting. Mark Gwozdecky, a spokesman for the Vienna-based International Atomic Energy Agency, told The Associated Press that agency experts were closely matching the evidence with information in the documents Iran provided last week. Iran faced an IAEA resolution to prove by Friday that its nuclear activities are geared only toward generating electricity — and not building a weapons arsenal as the United States contends. Under enormous pressure from the IAEA and Western governments, Tehran handed over a dossier last week with information about the program. But the agency can't judge whether the country has complied with its demands because it has not yet been able to fully verify the report, spokeswoman Melissa Fleming told AP in Vienna. "There is still a tremendous amount of work to be done to verify the accuracy and completeness of the information we received," Fleming said Friday. Agency officials have said the most difficult part of the analysis is the investigation of the origins of traces of highly enriched weapons-grade uranium found in Iran by agency experts. Iran insists the traces, found in environmental samples, were inadvertently imported on equipment meant to generate electricity. The world's official "nuclear club" currently has seven members: Britain, China, France, India, Pakistan, Russia and the United States. Israel is also believed to have the bomb, but has never said whether it does or does not.